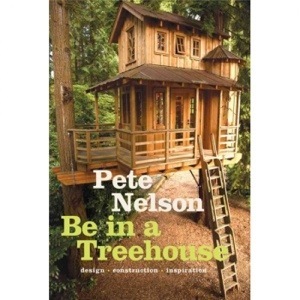 the new book from Pete Nelson, author (besides others) of Treehouses of the world and New treehouses of the world, is on shelves! Like in his other books, published also by Abrams, New York, you find many inspiring pictures of treehouse variations from all over the world plus a lot of very useful tips and tricks for making your own treehousedream come true. From the first scratch to how to choose the right trees, planning it, getting the permits if necessary and last but not least constructing it, on 223 pages the reader learns what she or he needs to know to go out and build his own treehouse. And if you don’t own that right tree, still the pictures in this book are very inspiring and motivating even for non-related projects of all sorts. Treehouses are magic! Even just as prints on paper.